This outfit post isn’t too dissimilar from the last :-s ok it’s pretty much the same. But this is what I wear, this is what I have always worn. Leggings. Basics. Leggings pretty much are my ‘mum’ wardrobe. So cliche, but so very true. As I’m still breast feeding I have to wear two pieces. Tights and skirts just seem like way too much effort right now. So leggings it is. These leggings are from American apparel. You can find them here. They are my favourite leggings OF ALL TIME. High waisted obvs. My white long sleeved tee is from primark. I wanted it oversized so it’s a size 16. Also from there is my beloved long line cardigan. 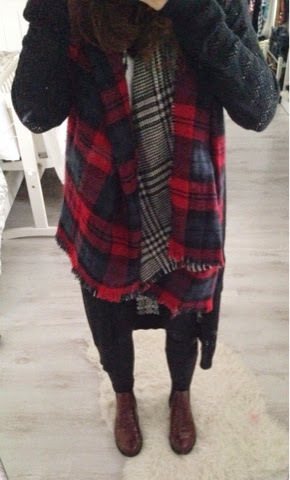 The tartan scarf is from eBay and you can find it here. My boots were from asos a few years ago but you can find similar here.